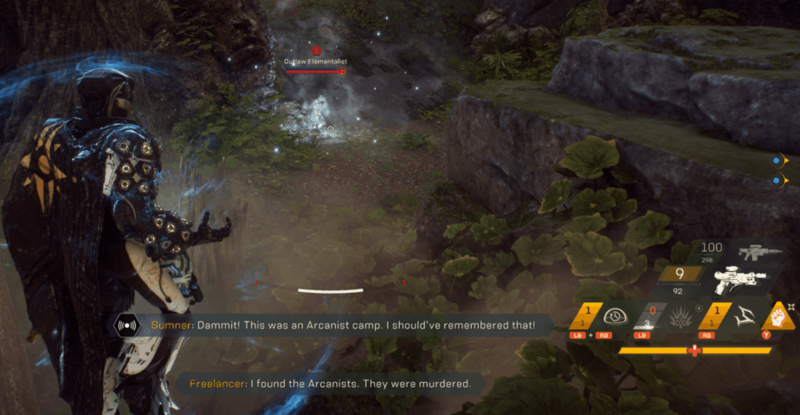 Warning: this article contains light spoilers of Anthem’s story. Have you ever wanted to play a game where you can enter a high-tech piece of armor and fly around like a wannabe Iron Man on an alien world, while getting powerful loot? 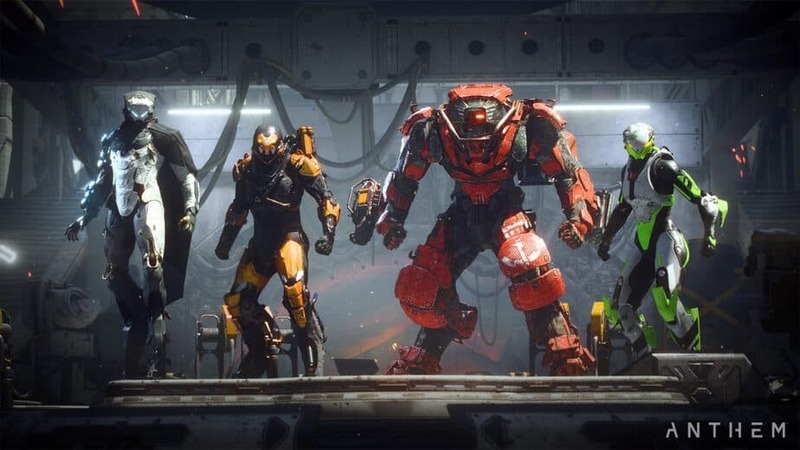 Well, look no further than the online multiplayer, third-person shooter/loot-based action game called Anthem, developed by BioWare and published by Electronic Arts (EA). From left to right: Storm, Ranger, Colossus, and Interceptor. Image by BioWare and Electronic Arts. No matter which Javelin you select, and how you customize it, flying around in-world and exploring Bastion (the outside area of Fort Tarsis) is crazily fun, and the same can be said about the combat system. Stringing together combos, using a new weapon, or using an ultimate (the Javelin’s main attack move) brought a smile to my face. Each Javelin has defensive capabilities, such as the typical bubble shield and a giant barrier. As for the weapon choices, you have your standard assault rifles, light machine guns, pistols, shotguns, and snipers. Depending on the rarity levels of each gun class, players are going to have fun blasting things to smithereens, and certain perks will help with that. Be warned that the enemy AI will feel like bullet sponges at times, but I still had fun blasting enemies with my friends. I will say that once you hit a certain power level, unless noted, I recommend staying with the “Grandmaster 1” difficulty level when farming for loot, because you will be able to team up with others more often to achieve your goals, and still get the same amount of loot you need to level up. When I played the “Grandmaster 2” level of difficulty, the loot was no different from what I was already getting, and I had to complete a couple of the harder missions alone, since the game was unable to find companions for me, even though Anthem has a matchmaking system to prevent this. When one player finally got in to help, he/she left a few minutes later. Plus, the battles go on too long, even at the recommended power levels, so hopefully BioWare will entice the player pool with something juicy later on, to justify playing at the harder difficulty level. As you advance through Anthem, you are paired up with a group of in-game characters that will help you along the way, while you level up your unnamed (rookie) pilot. Your mission: stop The Dominion (No, not the same faction from Star Trek: Deep Space Nine) from destroying the planet with an ancient relic. At what seems to be the very end, you’ll face a boss that looks like Steppenwolf from Justice League, and the second half of Anthem begins. Basically, it is grinding time. The Storm Suit in Action. Personally, I do not mind grinding for better items, yet replaying the same missions repeatedly does get tedious/dull after a while, so I can see why other gamers may not love this type of gameplay. For example, you are either standing on a certain spot until time runs out, collecting a certain number of items and bringing them back to complete a checkpoint, or killing all the AI around you before moving on. But hey, that’s how loot-based games roll, right? Even then, the loot system needs an overhaul. Getting weaker gear even when I’m at a higher level and playing the harder difficulties shouldn’t happen nor should there be such a very small chance of getting something interesting. It makes a player not want to play the game for a while, nor try the harder difficulties at all. So I do hope that BioWare follows the path of Diablo 3, the dungeon crawler/action role-playing game that also had a bumpy launch. After update 2.0, the game became fresh and engaging. Loot-farming became fun again because the gear and the quests to get stuff was worthwhile. I bet that I am not the only one thinking this. The other best part of the game is Anthem‘s in-game visuals, which are gorgeous to look at, so I recommend flying around Bastion to fully appreciate BioWare’s hard work. 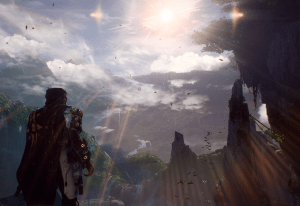 Yet Anthem‘s story is something left to be desired, thanks to its weak missions and so-so narrative. Sadly, it never really grabbed my attention, so I was content to merely finish each mission and move on. I did find some enjoyment in learning more about this strange, beautiful world I was in, though! In Fort Tarsis, you will meet new strangers and the game will prompt you to say something ‘nice’ or ‘bad’. Once you complete the first steps, it will continue this in-world character progression until a conclusion is met. Yet it sure felt like my choices did nothing major to impact the game at all, although we shall see as time goes by. Still, even when acting ‘mean,’ there was no dire consequences to my previous decisions, but I did try to fix things when possible. Regardless, it sure felt like it was a lighter version of BioWare’s own Mass Effect, a game franchise that had an abundance of in-game chat options. That series would punish you if you made the wrong choices throughout the first game, and also during the sequels later on. Hopefully, that will be the case with Anthem, although the storytelling for each AI character was written well. As you walk through Fort Tarsis in first-person, gamers will notice how slowly they move, as if their Freelancer is using heavy-duty ankle weights, even when running. You can also visit the city’s vendors to access the store for some cosmetic shopping, either by using in-game currency you earn by playing the game, or using real-life money to buy ‘shards.’ Yes, there are microtransactions in Anthem, yet I personally do not find it to be a problem, since it does not affect the gameplay. But going between missions and your Javelin is going to be a chore, thanks to the game’s frequent loading screens. Yet to be fair, BioWare did issue a day-one patch on February 22 to address the long loading times, which are (somewhat) better now on my end, although gamers will still encounter the same number of loading screens when playing the game. In my opinion, it really does interfere with Anthem’s game flow. For example, when a mission is starting or completed, there are loading screens. Want to equip new gear or customize your Javelin? You get a loading screen when entering the “Forge” (the place where gamers can customize their suits) or leaving it. Not a fan of your current loadout after changing gear moments ago? Yep, load screen. Basically, it is Live Die Repeat but with load screens! 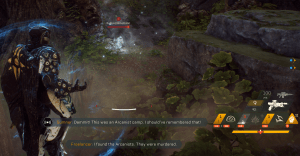 Another problem that’s plaguing Anthem right now is the large number of in-game bugs. Some have been fixed by BioWare, but others still exist as of this writing. I have encountered a few myself since the PC launch, such as not being able to enter my Javelin anymore in Fort Tarsis, but luckily the “Launch Bay” (the social area to meet other gamers) still allows me to access my Contracts/Agent missions. Another problem I’ve faced is that sometimes I can’t use my Storm’s elemental abilities during a battle without it stopping halfway through the animation process. Of course, BioWare is addressing each problem as quickly as possible and every new loot-based game will have its fair share of problems after launch. It’s just frustrating to see Anthem have these kinds of problems, but I do understand that it is hard to create the ‘perfect’ game. Destiny had its fair share of issues when the first game launch in 2014, as well as the sequel in 2017. The Division also wasn’t perfect when it launched, before any major update came in to inject new life to the game. Overall, Anthem could turn out to be a great game but will BioWare have a chance to fix its baby? Only time will tell. 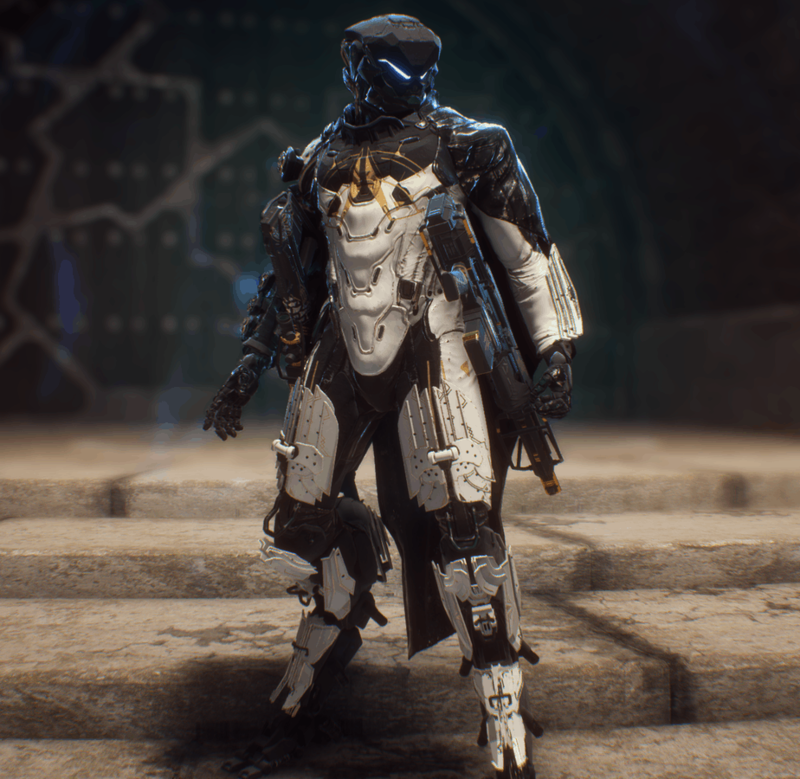 Looking back, Anthem achieved its goal: allowing gamers to be like a wannabe Iron Man. The game’s simple flying/shooting mechanics work, but its weaknesses are truly holding the game back from achieving greatness. 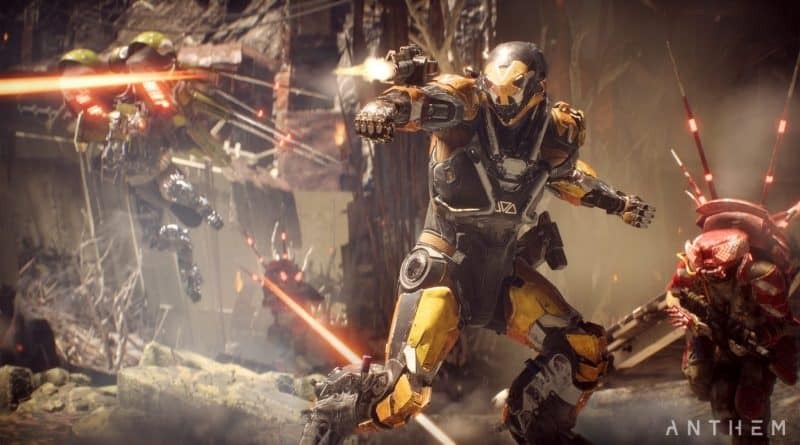 Perhaps the game was released too soon, and maybe Anthem wouldn’t be having so many issues if it had been released later this year instead of in February, giving it more time to cook in the oven. Regardless, I am curious to see where the next few months will go, and if this game will stay relevant long-term versus the likes of Destiny 2 and The Division 2. I surely hope that it does, because I do like the universe this game is based in. I do like the game itself. Anthem is available on the PlayStation 4, Xbox One, and PC. Have something to say regarding Anthem? If you do, please post away when visiting the FoCC forums!